Os Hate eram, cada vez mais, uma banda internacional mas foi apenas em 2003, por altura do lançamento do seu quarto álbum de estúdio “Awakening Of The Liar”, que o grupo entrou na rota das digressões europeias regulares, muito por “culpa” do contrato assinado com a Empire Records e Management, agência de grandes nomes polacos como Vader ou Vesania. Por essa altura, já Adam The First Sinner tinha iniciado uma verdadeira dança das cadeiras na formação do projecto, melhorando sempre tecnicamente os Hate ao mesmo tempo que os dotava de disponibilidade para novos “voos” e para regulares incursões nas temporadas de festivais na Europa. O passo seguinte chegou com “Morphosis”, o sexto álbum de originais, que foi editado pela Listenable Records, que deu à banda uma visibilidade exponencial, acompanhada por um impressionante salto de qualidade musical e por uma crescente personalidade própria na composição. Cinco anos e dois álbuns volvidos, a Napalm Records (editora onde actualmente militam os Moonspell) reconhecia o valor, honestidade e estatuto dos Hate, um dos últimos bastiões do death metal satânico. “Solarflesh: A Gospel Of Radiant Divinity” foi recebido com elogios unânimes por parte da imprensa e bons resultados de vendas. Dois anos depois, “Cruzade:Zero” confirmava a boa forma do agora duo: Pavulon, dos Antigama, é agora o baterista fixo que acompanha Adam, enquanto os convidados Kain (baixo) e Domin (guitarra) completam actualmente a formação ao vivo que se apresentará em Portugal. Os Noctem, veteranos da cena espanhola, são os convidados de luxo desta “Raid Across Euroland”, O death/thrash metal do grupo valenciano, bem enraizado no black metal, valeu-lhes na última meia-década, quatro álbuns de originais e o respeito dos seus pares. O enfoque da sua actuação estará certamente em “Haeresis”, o novo disco, que será lançado no final de Setembro pela conceituada Prosthetic Records. Os concertos acontecem nos dias 28 (Hard Club, Porto) e 29 (RCA Club, Lisboa) de Novembro, a partir das 21 horas. Os bilhetes estarão disponíveis em breve. Brevemente serão anunciadas mais duas bandas de abertura. HATE has always meant the essence of extreme and unholy metal, and as such, had tremendous influence over forming Polish metal scene in the nineties and nillies. Established in 1990 in Warsaw by a guitarist and vocalist ATF Sinner, the band has quickly become one of the leading acts in the Polish underground. HATE’s music was always elaborate death metal with lyrics concentrating on apocalyptic themes, spiritual mysticism and dark part of Self, showing distinct anti-god attitude. In 1992 the first demo “Abhorrence” was released by a small underground label Hate Productions. After numerous line-up changes and releasing a series of records available solely in their native Poland, the group inked their first international record deal with an American label World War III in 2000. At that point the band was given an opportunity to leave obscurity of Polish underground in which they remained for a decade. Soon HATE’s early material was published on two discs titled “Holy Dead Trinity” (2000) and “Cain’s Way (2002). A year later, the band signed another contract with French-based label – Listenable, and released their next, highly acclaimed album “Awakening of the Liar” (2003), which is considered one of the Polish death metal masterpieces. In 2004 the group was working on an official DVD material titled “the Litanies of Satan”, which was soon published by Metal Mind Productions. In that period the band’s style acquired new characteristics – industrial and ambient elements appeared in the background of the main riffs. This kind of arrangements were further developed on the next album titled “Anaclasis – a gospel of malice nad hatred” (2005), which no longer presented classical death metal but ingenious combination of death, black and heavy metal with distinct industrial influences. “Anaclasis” got great reviews in almost all metal magazine across Europe and was highly acclaimed as one of the most innovative records in the genre. 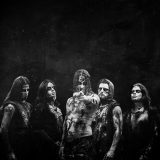 In support of the album, the band went on their first full-fledged European tour with Carpathian Forest and Keep of Kalessin and appeared on a few important festivals such as PartySan Open Air, Winter Assault and more. In 2007 the band once again went on a European tour, this time accompanied by their countrymen Decapitated. January 2008 saw another album from HATE which was titled “Morphosis” and released again via Listenable. The record showed fast musical development of the band, as well as the production part. 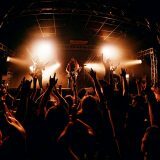 HATE got offers from numerous festivals, such as Neurotic Death Fest, Brutal Assault, Screamfest, Metalcamp, Summer Breeze O.A., Metal Heads’ Mission and more. In May 2008, the group realized their first official video-clip for the song “Threnody”, which was shot in an actual coal mine in Silesia/Poland. The album “Morphosis” has also been officially released in the USA, South America and Russia. The year 2010 saw the band’s further development and intensive touring schedule. Their next album “Erebos” was supported by intensive tours in both Europe and America with groups such as Hypocrisy, Sepultura, Rotting Christ and Mayhem. The band also visited Brazil, Mexico and Russia reaching as far east as Siberia with their shows. Coming back home from the tour, HATE shot their second official video for the title track “Erebos”. In 2012 the group inked a new record agreement with Austrian-based label Napalm Records. The album titled “Solarflesh” was released under the new flag in the beginning of 2013 receiving a lot of praise in the music press and gaining the band more recognition the world over. In March/April 2013 the band was traveling through Germany on a European tour with Sweden’s death metallers Hypocrisy. In the early morning of April 6th, HATE’s bassist Sławek “Mortifier” Archangielskij died in his sleep near the city of Munchberg. He was discovered lifeless in the morning by other band members. An ambulance was immediately called in and Slawek was reanimated, but to no avail. An autopsy revealed that the cause of death was cardiac arrhythmia. Mortifer’s tragic and unexpected passing was a hard blow and the band’s contunuation was at question for some time. After a few weeks, however, the musicians announced that they would come back. Having Mortifer’s wife Aleksandra on bass guitar, HATE took part in Hellfest Festival in France in June 2013. Afterwards the band played a series of summer festivals around Europe with a session bassist and announced that they would work on a new record. 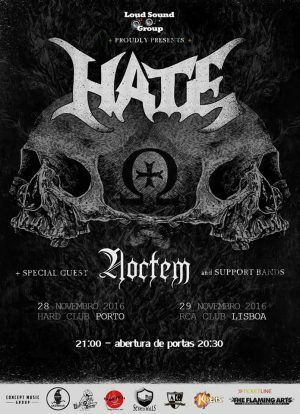 In March 2014 HATE set out on a tour across Europe again, this time in the company of Norway’s Kampfar, and in June they entered Hertz Studio in Poland to start recording the 9-th full-length album with release pegged for early 2015 through Naplam Records. The new opus will come out under the title of “Crusade:Zero”.